TURQUIE – Zeugma - The excavation of the ancient city of Zeugma, near the town of Nizip in Gaziantep Province, has uncovered some small remnants of sculpture. The Zeugma site in general has had very rich season in 2012, the head of the excavation, Dr. Kutalmış Görkay of Ankara University, told Anatolia news agency. The excavation opened in June this year. “Our main work has been at the Muzos House site, and we also conducted excavations at the Roman House and other areas. Work will continue at the same sites in future seasons. We also conducted research about the ramparts of the city of Zeugma, with visiting researchers from England and Germany,” Görkay said. Most of this year’s work took place on a hill known as Belkıs Tepe. “We found some parts of cult-related sculptures on Belkıs Tepe. ... Many remnants of sculptures were unearthed,” Görkay said. 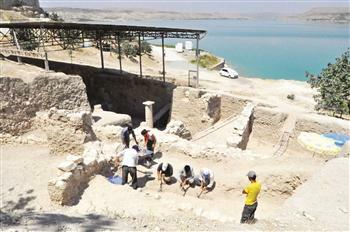 This season’s excavation work at Zeugma will continue until the end of August, Görkay said. INDE – Rawerkhedi - Failure of state government and archaeology department in relocating cenotaph of Bajirao Peshwa-I at Rawerkhedi coming under Narmada dam water submergence has pegged social and literary organisations - Marathi Sahitya Academy and Marathi Samaj Indur to take an initiative. Shrimant Baji Rao Balaji Bhat (August 18, 1700 - April 28, 1740) known as Baji Rao I, served as Peshwa (Prime Minister) to the fourth Maratha Chhatrapati (Emperor) Shahu. He is credited with expanding the Maratha Empire from Attock to Cuttack. 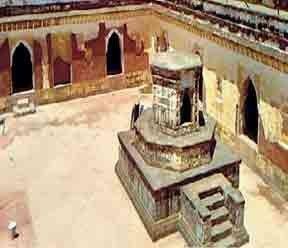 Baji Rao is most famous of the nine Peshwas. He fought over 36 battles and is reputed to have never lost. The later Kingdoms of Scindias of Gwalior, Holkars of Indore, Gaekwads of Baroda, and Pawars of Dhar were Baji Rao's creation of a Maratha confederacy as he wreaked havoc on the disintegrating Mughal Empire and set up his jahagirdars (governors). He moved the administrative capital from Satara to the new city of Pune in 1728. He died on April 28, 1740 due to sudden fever while inspecting his jagirs at the village of Raver Khedi, near the Tehsil Sanawad where his mortal remains were consigned to flames on the banks of river Narmada. USA – Brooklyn - Nothing is visible at the intersection of Third Avenue and Eighth Street in the Gowanus section of Brooklyn to indicate that anything extraordinary is there. But if a small group of history enthusiasts are right, this particular corner of Kings County is hallowed ground. They believe that there is a mass grave a few dozen yards to the east of the intersection that contains the remains of American heroes: soldiers from the First Maryland Regiment under Col. William Smallwood, which saved Washington’s army during the Battle of Brooklyn on Aug. 27, 1776. Their burial site, these advocates say, deserves the same level of veneration accorded the military cemeteries at Gettysburg and Normandy. For New York’s relatively small community of Revolutionary War buffs, the Marylanders’ mass grave is sort of an archaeological equivalent of the Golden City of El Dorado — a legendary site, long sought but never located. But Mr. Furman’s quest is not just about history. In addition to solving an enduring mystery, pinpointing the Marylanders’ resting place could influence development near the Gowanus Canal in the aftermath of the planned Superfund cleanup of the polluted industrial waterway. ROYAUME UNI - Ipswich - An extensive archaeological excavation is under way on the site in preparation for the start of construction work. The excavation is uncovering evidence of middle and late Saxon Ipswich, as well as the ‘lost’ cemetery, and perhaps church, of St Augustine. Ipswich was one of the earliest, and most important, towns to develop in England during the 7th century, and the work is designed to reveal more evidence of early settlement beside the ford which once crossed the River Orwell. The extent of the cemetery, which probably developed during the 900s and continued in use until the Dissolution of 1536, has now been revealed, and work to carefully remove its remains for study and eventual reburial is ongoing. ESPAGNE – Atapuerca - The real estate boom and economic bonanza were the foundation of commercial archaeology in Spain. The country has many precious remains, from the ancient hominins of the Atapuerca Mountains—where fossils were first discovered when digging for a railway—to cities such as Seville, where key remains go back to the Lower Paleolithic. In bustling regions such as Madrid, there has been so much commercial archaeology that ancient physical landscapes of each period could be reconstructed almost completely, archaeologists say. Archaeologists salvaged thousands of artifacts during the boom, but now many worry about the future of commercial archaeology, and some call for reshaping the field. 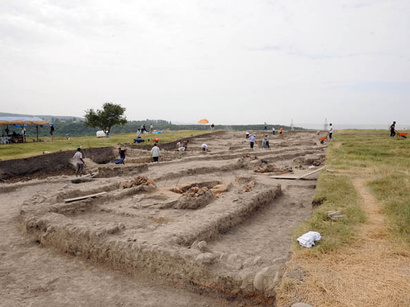 AZERBAIDJAN – – Shahtakhti - The Archaeology and Ethnography Institute has discovered in the ancient village of Shahtakhti artifacts dating back to the Eneolithic age, research officer Ghahraman Aghayev told Trend on Friday. He said a new layer was discovered, which had pottery and buildings' remains.